Study discovers the role of microglia in HIV-related neurological damage. Despite symptom-stifling anti-retroviral drugs, as many as half of all patients living with HIV experience neurological damage tied to chronic inflammation in the brain fueled by the body’s own immune defenses. In an effort to understand why patients who appear virus free are afflicted with AIDS-related dementia and other illnesses,previous studies have focused on disease-fighting cells, called macrophages and monocytes, as they traffic throughout the body and into the brain. However, little has been known about the timing and dynamics behind these types of white blood cells as they invade the central nervous system during the initial stages of HIV infection or at the onset of AIDS. Now, a new investigative approach in SIV-infected rhesus monkeys from researchers at Boston College, the University of Florida and Tulane University has yielded fresh clues that show the caustic interplay between macrophage and monocyte traffic in the central nervous system and the onset of HIV infection and the formation of brain lesions tied to neurological damage. The study is published in the journal American Journal of Pathology. The data findings showed that macrophages accumulate in different parts of the brain during different stages of initial infection, a finding that clarifies the spread of infection to the brain is a multi-layered and dynamic process. The team state that this type of approach allowed them to label macrophages in the perivascular space in the brain to identify macrophage and monocyte traffic to the brain in the early, mid and late stages of infection. They go on to add that the medical community now know what cells bring the virus to the brain and which cells contribute to neurological damage in the brain, as well as the timing of the entry of these cells and when the pathologic virus enters. These are two big questions previous studies have eluded to. The researchers tagged monocytes, destined to enter the brain, in bone marrow with a biochemical marker known as BrdU and also used a series of different color dyes to label macrophages as they entered the central nervous system at different times in infection, including early, mid and terminal states. 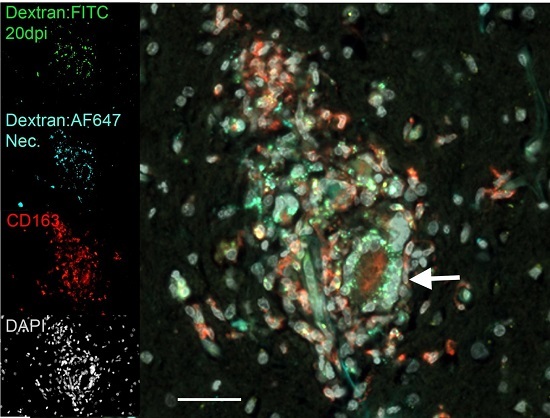 As infection progressed, the researchers found MAC387 macrophages accumulated in the meninges and choroid plexus in early-stage brain infection. Later on, MAC387 macrophages were found in perivascular spaces that surround arteries and veins in the brain, as well as at sites where brain lesions would form. Another macrophage, known as CD163 macrophages, was traced to perivascular space and brain lesions during the late stage, the team reports. Late in infection, the volume of macrophages entering the brain was nearly three times as great as during early-stage infection. The team explain that it is important to learn what drives the pathology and the resulting damage in the brain, the virus itself or macrophage and monocyte cells. What the current study found is that these cells that arrive late with the development of AIDS have a 2.9-fold higher percentage of being infected with the virus. So there is a dramatic increase in the viral load as infection progresses that correlates to macrophage accumulation. Turning their attention to lesion formation, the researchers discovered that greater than 80 percent of the macrophages found in the lesions were present in the brain prior to lesion formation. The surprising finding suggests the cells in the lesions migrated from non-lesion sites in the brain rather than from outside the brain. Brain lesions are central to understanding what causes AIDS-related dementia, state the team. In early stages of infection, the researchers could see two or three macrophages scattered along the vessel. By the late stage, when lesions appeared, there were 30 to 50 at the site. What the results found is that a majority of the cells in the lesions were present in the brain at an early stage. So these macrophages are migrating from the brain to the lesion sites, which shows a complex and dynamic level of activity. Dyes illuminate macrophage and monocyte cells as they arrive in the brain, where their presence is tied to neurological damage in people otherwise living symptom-free with HIV. By using different colored dyes to tag these disease-fighting cells, researchers have developed a clearer picture of how and when macrophages and monocytes accumulate in different parts of the brain during stages of HIV infection and the onset of AIDS. The findings, reported in the American Journal of Pathology, add new evidence about the role of these cells in AIDS-related dementia and other illnesses. Credit: Amer. Journal of Pathology.